ACH commonly incorrectly referred to as “Automatic Check Handling” was initiated in 1972 in California as a joint venture between banks and the regional Federal Reserve to optimized paperless check transitions. Widespread success of this effort lead to the establishment of the National Automated Clearing House Association (NACHA) in 1974. In 1980 the Monetary Control Act allowed private sector ACH operators to compete with the Federal Reserve Bank. Today both NACHA and the Federal Reserve govern the rules and regulation of the ACH network which processes over 8 billion transactions and $21 trillion. The Federal Reserve Banks, through the use of FedACH their centralized application software, process nearly 60% of commercial interbank ACH transactions. The Electronic Payments Network (EPN), the private sector ACH operator processes the remaining 40%. 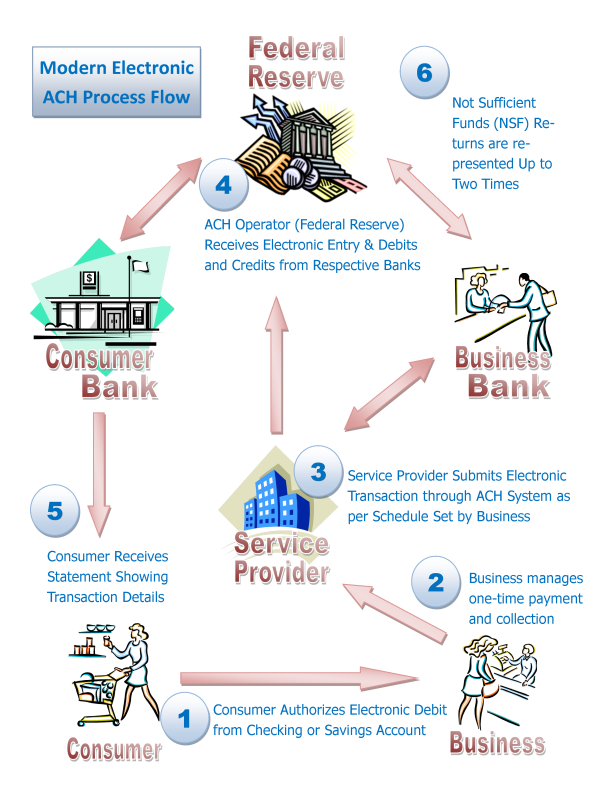 View the chart below which outlines the process flow of an ACH transaction. In the case below we are assuming the Federal Reserve Banks as the processing network. ACH processing is much more cost effective than credit card processing and depending on your business type and the process in which you take payments may be a viable alternative or solution to run in parallel. The critical issue other than cost is to ensure the right acceptance process and technology to ensure that your payments are promptly and safely deposited. Total Merchant Network brings over 10 years of industry experience in determining the right solution for businesses that will both minimize costs and increases process efficiency.